If you follow my blog, you know how much I love to thrift shop, so I'm sure it's no surprise that I love to thrift shop for my baby too. Baby clothes can be so expensive at times. I hate to spend a lot of money on baby clothes, because they grow out of them so quickly, plus they get their clothes so messy, that's why a thrift store is the perfect place to buy clothes for my little guy. I am grateful that our family members and friends have kept Jack clothed for so long. 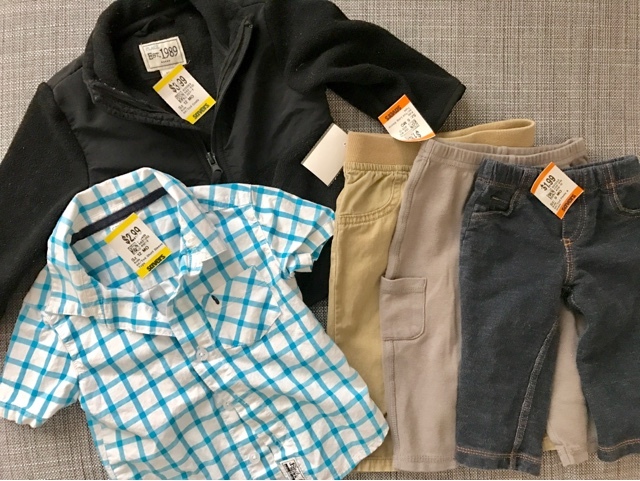 I have so many cute outfits for him that we got as gifts, but he's quickly growing out of many of his clothes, plus the weather is slowly getting cooler, so it's time to start shopping for the winter. One nice thing about having a boy is that they are so low maintenance, even as babies. All they need are some oneies, some pants and a jacket of some sort. Last Friday, I went to my favorite thrift store, Savers. They tend to have a very small boy selection, so when I find cute things, I buy a lot. It was Nevada Day on the day I was there, so all the clothes were 30% off, plus I bought 2 yellow tag items that were 50% off. I ended up buying him 3 pairs of pants, a button down shirt and a fleece jacket all for under $10. That's not bad considering I already know that my little guy will only wear them for 3 months, then it will be back to summer clothes again. That's okay, because I will just have another excuse to do some more thrift store shopping.